Today United Launch Alliance announced there next generation launch system named Vulcan. ULA’s Tory Bruno announced that the new launch system will be rolled out in multiple steps. The first step will be the replacement first stage, followed later by a new upper stage. The first stage of the rocket will be powered by two Blue Origin BE-4 engines providing 1.1m lbs of thrust and can be configured with up to six solid rocket boosters to increase the total payload capacity depending on customers needs. To take full advantage of the power provided by the new engines the first stage will contain larger fuel tanks. 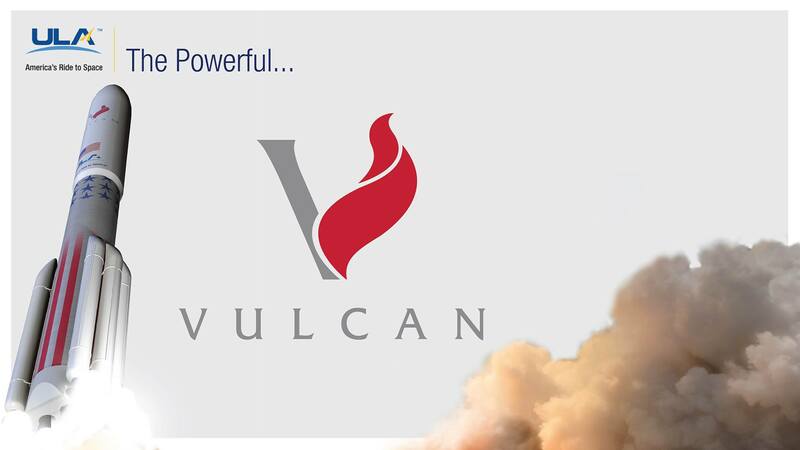 The first flight of the new Vulcan rocket is expected in 2019 and will use the current Centaur upper stage. The new upper stage Advanced Cryogenic Evolved Stage (ACES) will change depending on the needs of the customer, it will use between one and four engines as well as ULA’s new Integrated Vehicle Fluids System which will allow un-limited burns and also refueling. No date has been given yet on when they expect to fly the new upper stage. In addition Tory also announced that the Vulcan rocket’s main engines would be re-usable, the engines would detach from the stage after first stage separation and would then be captured in mid-air and returned to base for inspection and integration for another launch. Tory also announced that later this year they would be outlining a new method for buying the rockets, more details to follow.